65 For him ye pisseth blood take a good quantity of rew otherwise called hearbe-grace and dry it so yt you may beat it to powder and then take ye powder and drink it with ale. 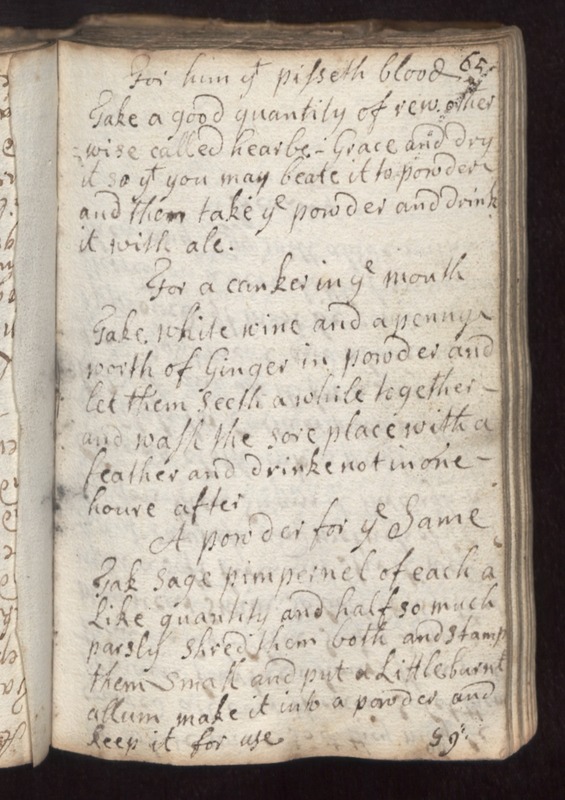 For a canker in ye mouth take white wine and a pennys worth of ginger in powder and let them seeth a while together and wash the sore place with a feather and drink not in one houre after. A powder for ye same tak sage pimpernel of each a like quantity and half so much parsly shred them both and stamp them samll and ut a little burnt allum make it into a powde and keep it for use.